Jack has become accustomed to being ridden by Ken and to Annette cleaning around his eyes. When Jack first came to the Gray farm, he had issues. Anyone who encountered the cantankerous, obstinate and crazed wild donkey would have thought the name Jack was short for something that truly reflected his character. How he earned the affectionate nickname Apple Jack is a story of patience, trust, and mutual respect between a McKellar family and a frightened and neglected animal. Ken Gray and his wife, Annette, will never forget the day Jack arrived at their farm at the end of West Road in August 2009. “Our first sight of Jack was when the two cowhands that delivered him, each with a rope, swung open the trail gate, hollering: “Look out, everybody out of the way,” as they rassled him, one at each end, into the pen and gratefully released their charge,” Ken recalls. A gnarled halter, now too tight for his adult face, was fused into a mass of adhesions above his muzzle. Gouges and wounds oozed on his back and flanks, and flesh hung from gashes in his legs. His hooves – cracked and overgrown with rot – were rank with a putrid odour. It wasn’t at all what Ken was expecting either. The family had decided to get a donkey to help haul water and wood to their home, which operates off the grid, without running water. It would also be a means of transportation since their road, at the time, was impassable for part of the year. Ken paid $300 for three bales of hay, the donkey stallion, and delivery by trailer from Pefferlaw to the Gray farm. Now, pacing wildly before him was a neglected, injured and unpredictable beast. He’d spent the first four years of his life enclosed on 200 acres, left to his own devices with a horse stallion to terrorize him, supposedly for company. “No feed, water, shelter, vet or farrier to this point,” Ken recalls, shaking his head. The day before, the cowhands had lassoed him in the field and tied him to a post inside a barn. Overnight, he broke free, still dragging the broken barn rail behind him as he ran into thick brush. Eventually he became entangled, further compounding his injuries. The first vet visit to administer shots at the Gray farm didn’t go particularly well. To alleviate everyone’s anxiety Ken promised to build a set of stocks for Jack’s visit with the vet and farrier three weeks later. Stocks come in many variations but the basic principle is the same, says Ken. Chains secure the animal within a given space that is indestructible to the animal’s efforts to escape. “You and the animal remain safe and you can remain calm and take your time administering any number of functions in the “cave” of the animal,” he explains, adding that, in time, the animal feels secure when trying new things on him within this space. Now, with Jack on the road to good health, the focus shifted to working on trust issues. Conveniently, it was September and the farm’s apple trees were loaded with juicy treats. As he walked from post to post, placing apples around Jack’s pen, the leery animal began following him. In time, the donkey wasn’t so apt to bolt when Ken approached. “But no way would he trust me,” Ken adds. To allay Jack’s fears, Ken would often go into the pen, and sit on an overturned bucket with apples strewn around him. He’d hum or sing quietly, as Jack ate or walked away. To allow Jack’s face to heal, the Grays removed his halter and contained him in his pen for a week, while introducing him to a rope and new halter. While winter can be the best bonding and training time, Jack’s first winter was a little tough, as he struggled to regain strength and health. He still hadn’t learned to trust the Grays, or any humans. Three hurdles to be overcome were: blankets, brushing and his feet. During the first winter he was sheltered in the shed and an adjoining pen, Ken had built for him. The shed was built up off the ground, two steps high to teach Jack how to step up, and eventually he would learn on his own, to trust going in and out of a building or trailer. With frosty winter cold under the shed, Ken wanted to put a blanket on Jack, but he refused the first night despite the mercury dipping to minus 20ºC. Basic grooming was next. The farrier returned in the spring to work on Jack’s feet and then Ken tackled brushing. “Until spring came and his hair started coming out, he would not let you put a brush on him,” Ken recalls. “When he realized it felt good to get that dead hair out, he understood and now loves it. The stocks make everything new safe, calm and possible.” The stocks played a major role in the final grooming hurdle of coaxing Jack to allow Ken to work on his feet. Even this past winter, Jack’s feet remained Ken’s greatest concern, when frozen wood chips from his stall clumped, rock-hard inside his hooves. For the first year, Jack was anxious, pushy and grabby about food. Ken describes it as behaving like an underprivileged child might when presented with plenty. For the first two years, it was always a balance between feeding by hand to encourage trust, but risking being bitten; and not feeding by hand and being bypassed. Over time, Jack learned that bad behaviour means no carrot, or apple or water or hay or walks or attention. Donkeys also need exercise and opportunities to forage, otherwise they can develop fat deposits on their necks. Dragging a tire with a heavy collar exercises their necks and, in time, they become incredibly strong. Doing this also taught Jack to work in harness, build up his strength and not fear objects dragging behind him. When the tire became tangled around trees in the bush, Jack never panicked, but simply stood patiently calling for help. But the tire-dragging exercise soon became a nuisance. Jack’s free reign on the farm meant innumerable overturned potted plants, boats, lumber and implements. Plus, he quickly learned that whenever he wanted something, all he had to was call. 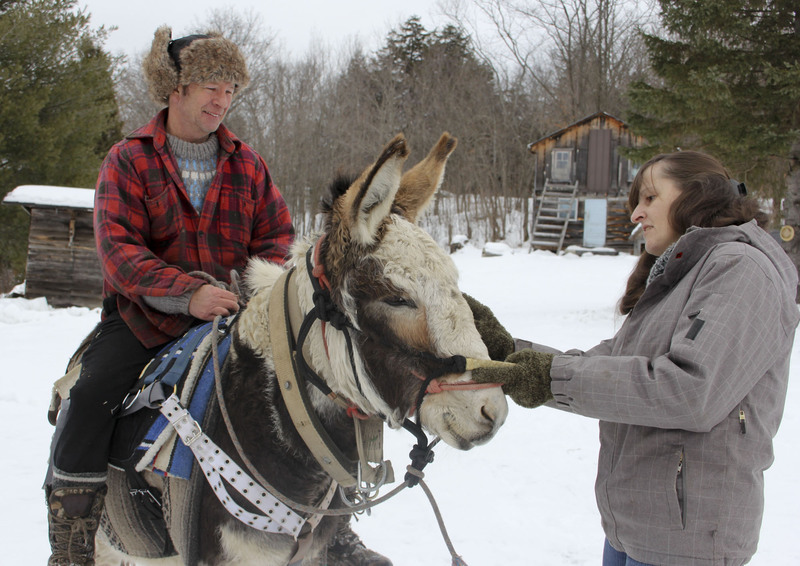 Donkeys have incredible hearing and the second Ken’s feet hit the floor in the morning, Jack calls from the barn. And their day together begins. In anticipation of Jack’s condition, trust and behaviour improving, Ken built a working harness, a packsaddle, V-plow, a travois, a wheeled travois, a chariot cart and a riding saddle. Jack’s primary motivation or supplication is food. Next, he considers his safety. This, Ken says, is where the stubborn part comes in. Jack’s favourite activity with his human friends is going into the village of McKellar with his packsaddle. The more weight he’s carrying, the more care he seems to take, and the better he behaves. The Grays have packed up to 60 pounds of groceries and water, which is less than half of what he is rated to carry for his size. Working in harness, Jack is adept with a plastic sleigh hauling water from the well or wood from the shed, to the front stairs of the Gray home. Snow or not, he’ll drag a 200-pound load with ease. Daily handling, Ken says, has been key to their success together. His biting, although still frequent, has diminished to a grooming-like nuzzle, that Ken can brush off or abate with a reprimand. Anyone intent on riding Jack at the farm, should like going into the village – because that’s where he’ll head. Not fast. With so many sights and sounds to consider, the usual 20 to 25 minute walk to the village takes an hour on Jack. That’s his pace until he hits McKellar. On three occasions Jack has, for no apparent reason, decided it’s time to go for a blast. “He starts running back and forth on his rope and won’t let you near him. Then he rushes to the end and squats and pulls like a workhorse on a heavy log trying to break it. This is so unusual because he is typically so careful. Eventually something breaks and off he goes, galloping out the driveway and off into (McKellar village). Once there, he visits as many homes as possible and people come out handing out treats, like it was Hallowe’en. He won’t let anyone near him though. Catching Jack, is where Ken says all of the studying, handling, trust, bonding and experience come into play. Once caught, Jack is quite content to follow his tractor buddy home. To try to keep him from feeling the need to escape, Ken tries to take him in to town often. Apple Jack loves to meet people. Jack gets his picture taken a lot. It’s not uncommon when the family gets out with Jack, that someone will stop their car, or come out from a store or home, to take his picture. At a concert at the McKellar Community Centre this past Christmas, the Grays took Jack along, decorating him festively for the season. After the concert, delighted McKellar folk gathered to have their picture taken with Jack. This entry was posted in Spring, Spring 2012. Bookmark the permalink.